MELBOURNE, AUSTRALIA, and KUALA LUMPUR, MALAYSIA	- 22 Aug 2007: IBM (NYSE: IBM) today announced that live sales avatars from Australia, Singapore and Malaysia will staff its virtual IBM Business Center at http://slurl.com/secondlife/IBM%20Business%20Center////. This team will also help clients from New Zealand. They join others from North America, Latin America and Europe who started working there in May. This means the center, which has had 10,000 visitors since it opened, offers visitors the opportunity to connect with a real IBM representative 24 hours five days a week. The virtual Business Center offers a place for IBM sales people, clients and partners to meet, learn, collaborate, and conduct business together. 24 hours a day and five days a week. It has six areas: Reception; Sales Center; Technical Support Library; Innovation Center; Client Briefing Center; and Conference Center. Accessible through Second Life, it is unique because it is staffed by real IBM sales representatives from around the world, not robots or kiosks, who can chat with visitors in several languages and build business relationships. If someone wants to buy hardware, software or services or needs help solving a business problem, the IBM sales avatar will either help them or ensure that they are connected with the right IBM expert inside or outside of Second Life. Signing contracts, paying, or exchanging sensitive information would take place by telephone or through the web. "There has been a huge surge in the popularity of the web activities like social networking. People are very accustomed to meeting each other on-line socially. We've just applied that concept to the business world," said Paula Summa, General Manager, ibm.com, the company's decade-old telephone and web sales organization. "Social networking and virtual world participation is skyrocketing in Asia. Asia is, after all, a hotbed for 3-D gaming. Why not 3-D business, too?" added Summa. "Although this started as an experiment, it has resulted in sales leads," Summa added. "This is a new and exciting way for clients and IBM to do business." The combination of 3-D virtual experience, its existing 2-D web site, and real IBM people to conduct business is designed to make customers' business experiences more effective. The virtual center is staffed by ibm.com employees who speak one or more of the following languages: Bahasia Malaysia; Cantonese; Tagalog (Philippines); Mandarin; English; Portuguese; German; Spanish; Dutch; Italian; French; and Canadian French. IBM's Virtual Business Center's technical support library gives visitors access to technical information including Redbooks and Systems Journals. One advantage of going to a virtual world to get your information is that finding it can be faster and easier than just navigating a web site. In the virtual Business Center you can browse the 3-D book shelves, view a 3-D book or just ask the librarian, just like in the real world. "This is just one of several major steps IBM has taken to improve the overall online experience for its clients," said Summa. The news today follows an IBM web site, www.ibm.com, upgrade that started rolling out worldwide in June. The ibm.com web site in Australia now has a flashier home page and dynamic navigation which allows most visitors to reach relevant information in half the clicks it took previously. The change will take place in Singapore, Malaysia and New Zealand later this year. IBM's web site has three million pages of original content, the equivalent of all the pages of the books in a small town library. IBM has recently been recognized for giving its clients a positive online experience. In May, small and medium businesses ranked IBM number one in the online experience it offers, according to industry analyst firm Compass Intelligence. It analyzed 40 web sites including those of major information technology companies including Dell, HP, and Microsoft. IBM has five thousand employees in the Virtual Universe Community. Its employees are also visiting and working in other 3-D places like Active World and There.com. *According to Gartner, "By the end of 2011, eighty percent of active Internet users and Fortune 500 enterprises will have a 'second life', but not necessarily in Second Life." Second Life has more than nine million registered users up from one million in October 2006. More than 230 IBM researchers, consultants, and developers use virtual worlds to experiment with and develop social networking tools and to design new ways of learning and doing business. 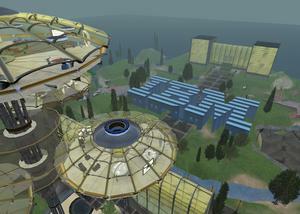 IBM has approximately 50 other virtual islands in Second Life for purposes such as research, onboarding of new employees, developer support and IBM internal and client meetings. For a related video go visit http://www.ibm.com/virtualworlds/businesscenter/? 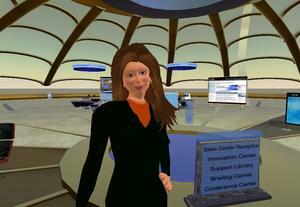 IBM developed this center with NMC Virtual Worlds, a virtual services unit of the New Media Consortium. For more information visit www.nmc.org. The avatar of ibm.com General Manager Paula Summa in the IBM virtual Business Center now open 24 hours a day and five days a week with live sales avatars. The center has had 10,000 visitors since it opened in May. The IBM virtual Business Center is now open 24 hours a day five days a week with the addition of live sales avatars Australia, Singapore and Malaysia, who work on the ibm.com phone and web team. Here are the avatars of ibm.com Executives General Manager Paula Summa and the VP of Asia Pacific Nic Nuske, who is based in Melbourne, Australia. A sales avatar from ibm.com's decade-old telephone and web sales organization takes visitors on a tour of IBM's virtual Business Center which has had 10,000 visitors since it opened in May. IBM's virtual Business Center is now open 24 hours a day five days a week with the addition of live sales avatars from Australia, Singapore and Malaysia. They also serve clients from New Zealand.